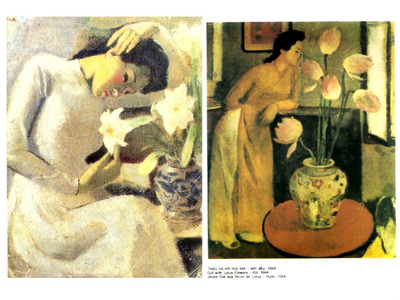 From the first exhibition of To Ngoc Van in Sai Gon (17/12/1930) to the day when he passed away in Dien Bien Phu campaign (17/06/1954), his artistic life lasted for 24 years with 2 phases of composition 1930-1945 (before the August Revolution) and 1945-1954 (the war against France). In fact, the social history had had a great impact on his career. If the art reflects the changes in social relations, To Ngoc Van’s paintings partially demonstrate such things. Indochina Fine Arts College was established in winter 1925 with the first Vietnamese artist generation such as Le Pho, Mai Trung Thu, Le Van De, Nguyen Phan Chanh, Cong Van Trung and Georges Khanh. To Ngoc Van was in the second Vietnamese artist generation had learned in this college. He had had the chance to be taught by French teachers, learned artistic technique such as history about the art of cubes, the application of natural colors in order to create renowned pictures afterward. Artist Tran Binh Loc wrote: “In terms of artistic field, To Ngoc Van career is worth being appreciated because he had a good vision, a quality that not all the artist did”. From the beginning, he did not accept the aesthetic ideal of Greece and Italian arts with cold shades of gray, respect for the symmetry, graphics glitches in the classic contour. He had discovered and asserted itself to find beauty, harmony between man and nature. 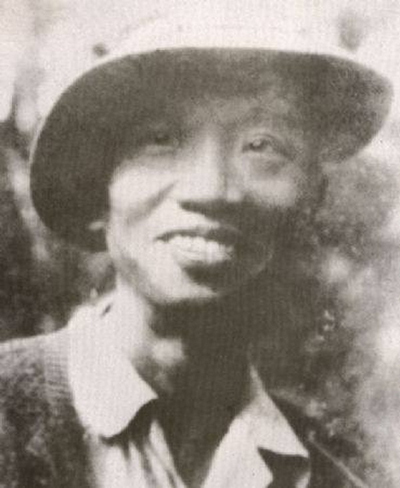 Graduated in 1931, To Ngoc Van had collaborated with some Vietnamese newspaper such as Phong Hoa, Ngay Nay, Thanh Nghi. Under his pen name To Tu, Ai My, he had written and painted many Vietnam paintings on those newspapers till 1945. 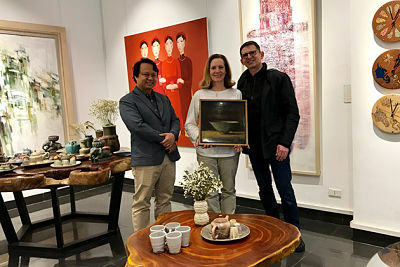 If Nguyen Do Cung was a talented artist, an archeologist, To Ngoc Van had completed his mission of opening a new aesthetic practice, a sharp art critic with his new conception of art in general. At this time, similar to the artistic aesthete of To Ngoc Van, Nguyen Do Cung had depicted a beauty through narrative “Live and Draw” that was issued in Xuan Thu Nha Tap Journal in 1942. This was a big journal issued many topics such as literature, poem and painting and created by Nguyen Luong Ngoc. Established in 1942, this group had their own art tendency, manifesto, the poem that followed “hermétique” style. Nguyen Do Cung’s work “Live and Draw” was based on To Ngoc Van’s conception about art. His conception accepted that art is a means of expressing emotion rather than a research about the ideal model of beauty. It also confirmed that art must evaluate the human’s value and emotion. He wrote: “I think that a beautiful picture describes my feeling. Therefore, I only believe that a man with full of emotion will become a famous artist”. All of the To Ngoc Van’s paintings in the period 1930-1945 had demonstrated his conception of art that expressed his personal feeling with the gorgeous tone of color. Although mainly exposed with classical art, French impression under the guidance of professor Victor Tardieu, Inguimberty, he realized the frivolity of the French impression that ignores the human’s emotion. Artist Tran Van Can said “To Ngoc Van had graduated in 1931. It was easy to spot the Gauguin’s influence in picture “Offrande” and Acgianta’s influence on the work “Cadeau de Noce” or Japanese art in work “two shepherd children”. Thanh Nghi newspaper number 87, 12/10/1944 made a comment about the art exhibition in 1944: “Along with warm yellow tone of color of some artists is oil pain with the bright cold shade of color of To Ngoc Van- an artist always loves his life. Under his eyes, the gloomy scene has something happy inside”. In fact, in terms of To Ngoc Van conception about art, color is the soul of a work no matter what material it is and the artist is the one who controls the emotion to find the inner beauty to express the sophistication of life”. Picasso said: “ I do not find but I see”. We can see that To Ngoc Van’s artistic conception was quite similar to Picasso’s conception. Young women are always the source of inspiration for the artists. For the artist, it is not only the beauty of the figure but also the beauty of the concept. It is immutable but flexible, transforming wonderfully in each pen brush. It is not an exception with To Ngoc Van. In the painting “Young Women with a Lilies”, by the Western realism and combined with the Oriental sensibility of To Ngoc Van, the young women in a white “long skirt” tilting her head naturally toward the vase. She appeared in a lyrical and innocent figure, evokes something very refined and peaceful. With a tight layout and a skillful way using color, “Young Women with a Lilies” has shown the softness and the charm in the curve of the young women and the rosy glow on her cheek. Especially, the pure white lily flowers embellished her beauty. 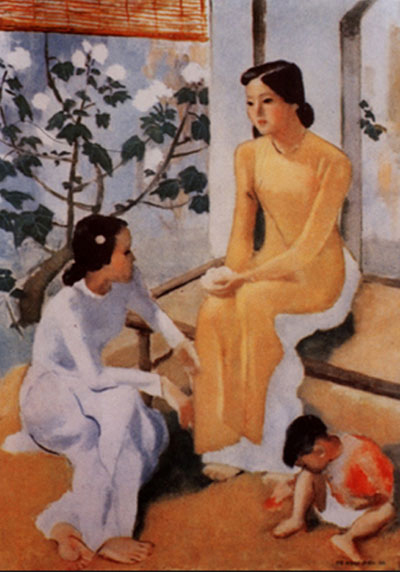 One of the most beautiful paintings by To Ngoc Van is “Two girls and a baby” which became the National Treasure in 2014. In the painting, the artist chose the scene which is a cozy corner in the house. The older sister in yellow shirt sitting gracefully on the bamboo pallet. The younger sister dressed in white with the restless sitting position. She needs advice from her sister for her first love. The scene of the ancient Vietnamese family appears in every detail of the landscape and the people. This entry was posted in Vietnam Art News. Bookmark the permalink.